One of my guilty pleasures though are these book series called "Cozy Mysteries." These books usually combine murder mystery and CRAFTS! I mean seriously, how could I not love them right? I love that they are a "fun" read but that they also keep my thinking and trying to work out the mysteries. 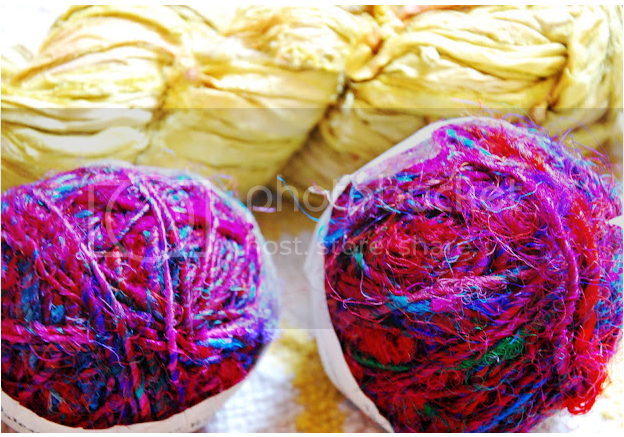 So while reading the knitting series, they begin to talk about this yarn that is spun from deconstructed vintage saris. Just reading about it, I knew that I had to find this amazing sounding yarn. I did a quick google search which led me to this site. I ordered this yarn and this one immediately and it was at my door in no time. I love the texture of this yarn, the fact that it's recycled and that deep down there is a story behind each fiber in this skein. Plus, the woman who owns this HUGE site, gives you her home phone number to call if you have any knitting questions?! How cool is that? Anyway, I am really excited to start making up a lovely scarf for the fall. I thought it was just me who loved those books! Nothing like something light and entertaining just before bed. That sari wool looks amazing! YES!!! I can't believe I forgot about these. i love this series because all of her stories take place in my city!!! Love her!! If you click on the links above, it takes you right to the authors page for each series and the link to all of the cozy mysteries. Seriously!?! Mysteries combined with crafting - I"m in love!!!! Never heard of it before now, but I am totally going to check it out! I'm a beadweaver, so I'll have to see if they have a beading series! I bet they totally do!!! those books sound awesome, def gonna have to look thiem up! I love the sari yarn. Going to order some. The website is great and the different colors make me want to make one in every color. I didn't know there were scrapbooking mystery books. Going to have to check those out. Thanks for the link and sharing this with us. Can't wait to see your scarf. I wonder if it will work for crochet? I've forgotten how to knit, but I found a local lady who is going to show me the basic stitches again.